Peace — Shalom. Recycling meets modern style. Handmade bowls by talented artisans in Moradabad, India. Serve fruit, bread or use as a display piece. Made using recycled bike spokes, showing care for our planet. This bowl is food safe. 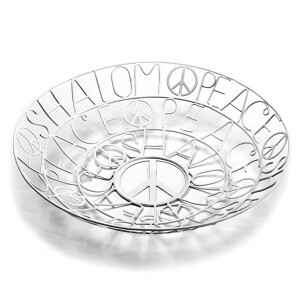 This Shalom bowl can be purchased at The Aesthetic Sense store in Mt. Kisco, NY or at their online store. Wholesale information can be found here.